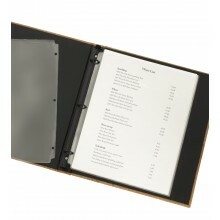 Our page protectors fit both our screw-post menu covers (i.e. Captain's Books) and our three-ring binder menu covers. Durability level: 1 out of 5 (Slightly Durable). This product is not meant for heavy use. Depending on the insert size, price-break levels may exist at: 100 and 200 units.